Hyoscine butylbromide, also known as scopolamine butylbromide and sold under the brandname Buscopan, is a medication used to treat crampy abdominal pain, esophageal spasms, renal colic, and bladder spasms. It is also used to improve respiratory secretions at the end of life. Hyoscine butylbromide can be taken by mouth, injection into a muscle, or into a vein. Side effects may include sleepiness, vision changes, triggering of glaucoma, and severe allergies. Sleepiness however, is uncommon. It is unclear if it is safe in pregnancy. It is an anticholinergic agent, which does not have much effect on the brain. It is on the WHO Model List of Essential Medicines, the most important medications needed in a basic health system. It is not available in the United States. The wholesale cost in the developing world is 0.004 to 0.11 USD per pill as of 2014. It is manufactured from hyoscine which occurs naturally in the plant deadly nightshade. Hyoscine butylbromide is effective in treating crampy abdominal pain. It is a quaternary ammonium compound and a semisynthetic derivative of hyoscine hydrobromide (scopolamine). The attachment of the butyl-bromide moiety effectively prevents the movement of this drug across the blood–brain barrier, effectively minimising undesirable central nervous system side effects associated with scopolamine/hyoscine. Hyoscine butylbromide is not centrally active and has a low incidence of abuse. ↑ Juo, Pei-Show (2001). Concise Dictionary of Biomedicine and Molecular Biology. (2nd ed.). Hoboken: CRC Press. p. 570. ISBN 9781420041309. 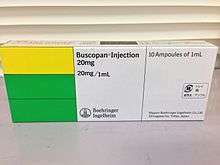 1 2 3 4 5 6 "Buscopan Tablets and Ampoules". Therapeutic Goods Administration, Australia. 8 November 2010. Retrieved 22 October 2013. ↑ Territo, editor, Dennis A. Casciato ; associate editor, Mary C. (2012). Manual of clinical oncology (7th ed.). Philadelphia: Wolters Kluwer/Lippincott Williams & Wilkins Health. p. 146. ISBN 9781451115604. ↑ Tytgat, G. N. (2007). "Hyoscine Butylbromide: A Review of its Use in the Treatment of Abdominal Cramping and Pain". Drugs. 67 (9): 1343–1357. doi:10.2165/00003495-200767090-00007. PMID 17547475. ↑ Samuels, L. A.; Christie, L.; Roberts-Gittens, B.; Fletcher, H.; Frederick, J. (2007). "The effect of hyoscine butylbromide on the first stage of labour in term pregnancies". BJOG. 114 (12): 1542–1546. doi:10.1111/j.1471-0528.2007.01497.x. PMID 17903230. ↑ "Hyoscine butylbromide (Buscopan®)" (PDF). UK: Guy's and St Thomas' NHS Foundation Trust. July 2014. Retrieved 16 June 2016.